Meet Ms. Kristin, the amazing lead junior kindergarten teacher AND team lead at La Petite Academy in Fairview, OR. 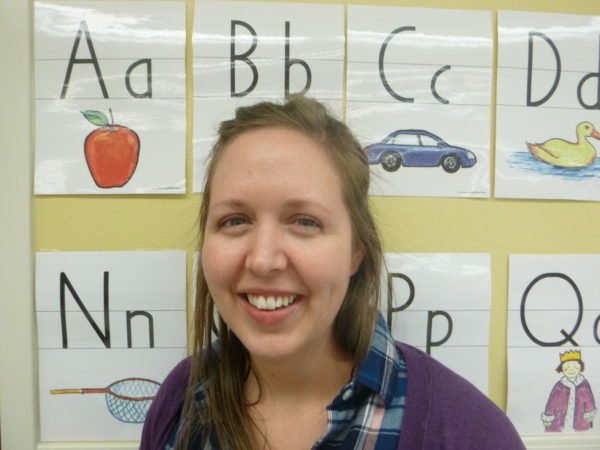 She has been working at the school for more than three years and has prior experience working as a tutor and elementary school substitute teacher. Read on to learn more about Ms. Kristin! What was it that inspired you to choose a career in early education? When I was growing up my mom had an in home daycare, so I really grew up around that. Once I started getting old enough, she let us be her helpers, so I developed an interest in that throughout my time growing up. What do you love about working with the junior kindergarten students? I love this classroom! They bring so many different challenges, but it’s so much fun to be able to teach them and to watch them grow and develop. I love starting off the year and seeing where they are, and then being able to see at the end of the year and how much they’ve grown and changed. And then some of those kids stick around and go to private kindergarten with us. It’s just a great class. Can you take us through some of the big components of your day in junior kindergarten? We start off the day with circle time where we review the weather and our calendar and then see who’s here today. The kids have different jobs, some are helping with the calendar and weather and some are doing the attendance. Then we’ll do our literacy reading time where we learn about out letter of the week, we read the story of the week and we go through different reading skills like listening for letter sounds or how many letters are in a sentence. Then we move onto literacy centers where they do different things like getting more experience with the letters through sensory play. After that we have lunch, then outside play, then in the afternoon after having a little rest time, we do our math. Then we do handwriting or we might do large group motor activities. One of the favorites is to do the yoga cards. They love that. One might be a hot air balloon, so they do the hot air balloon pose. What does it mean to be a “team lead”? I open up at 6:00 a.m. and I spend time doing whatever needs to be done to get the center ready. I also drive the bus in the morning, so I take kids to school. In general, I help out the parents, help upper management wherever they might need it. Kind of going between where I’m needed as a teacher but also filling in for whatever management needs. How do you maintain good communication with the parents at your school? I feel like as the team lead, I get to be in a little more of a unique position for talking with parents. I get to see then while I’m out front and also being the teacher, I see them in the classroom. Something that’s been a huge help for keeping the communication lines open with the parents is the brightwheel mobile app. We’re able to send them pictures of their kids throughout the day, and now we can even send video, to show them what they’re doing. What have you grown to love about working at La Petite Academy over your past three years? I think the community with the staff, the teachers and the friendships that have been built throughout my time here. There’s kind of a bond that formed. I’ve enjoyed the time I’ve been at La Petite, because what we do from as young as infants up through school age, we’re really teaching them. You can see what you’re doing and how it’s not just play all day. It’s teaching them how to talk, watching them grow. Why is early education so important these days? I think a large part that’s so important is the social aspect of it, especially now when we’re so into technology. So being able to come in and make new friends and meet new people and being around kids their own age, I think that’s huge. The education part is great, but the social aspect of it is so important, especially now.